The compact size of this RFID card wallet makes it easy to tuck almost anywhere and still protect you from electronic pickpocketing. 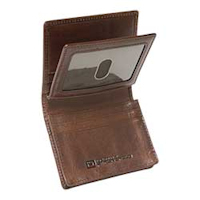 Four regular size card slots, one large slot, and one extra-large gusseted slot for stacking multiple cards or storing cash, clear ID window with thumb hole. The wallet is very slim but expands as more cards are added.